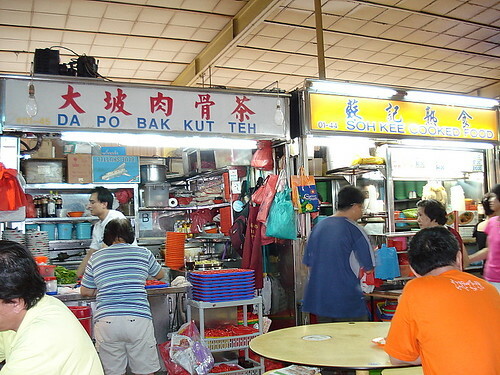 505 Jurong West Street 51 Hawker Centre - Keeping It Real And Grounded. Thumbs Up. It's been almost 10 years since I left Singapore and returned. One of the things I noticed is the sprouting of food courts everywhere and the slowly fading of the kopitiams (real ones not the food court bluff one) and old skool hawker centres. It saddens me as most of these so called food courts are just merely turn-key operations. They get the ingredients and supplies from a central processing factory and all they do is just throw them together, heat them up and serve. Gone are the days where the hardworking hawkers wake up at God-forsaken hours to buy and prepare their food for the day. Each with their own secret recipes and in some time-traditioned hawkers, passed down from grandfather to father to them and perhaps to their children in future. It's really no surprised if the same food at one of these places taste the same at another. And the kick in the teeth is that some of these hawkers charge exorbitant prices for it. We want more of the Katong Laksas (Katong only, please), Ampang Yong Tau Foos (Sembawang), Hougang Markets, Geylang Kopitiams and more. Those ultra-sanitised food courts really CMI lor. 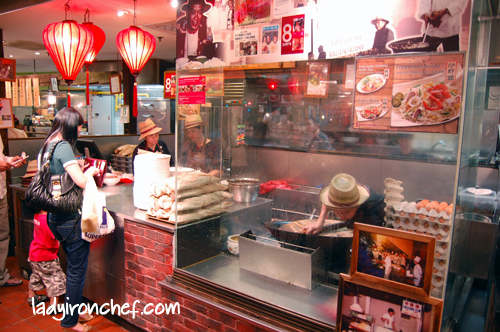 Thye Hong at Wisma Atria Food Republic - Gone Are The Good Old Days. Thumbs Down. JW I completely agree with you. Hawker centres and kopitiams always have the best food ever. Pam: Was just thinking about you.... missed you.... I here no have theatre/drama kaki to go with!!! sunflower: Not good enough lor..... Your house there the Lorong 5 hawker centre muuuuuuuch better lor. alex: haiz....everybody these days just want the easy way out. No pride one. dude... miss you too. sigh. am thinking of going back in aug. you still travelling loads in your new job? otherwise can we make a date - will you let you know when flights are booked! (as an aside - am going to watch a play next month sometime with a friend in london - and get this, one of the cheaper tix is 33 quid! top dollar is 50!! OMG). Pam: The prices here these days also not cheap liao.... goto http://www.sistic.com.sg and see for yourself. Look forward to see you in August. I don't travel very much. Furthest is KL only. I declined to fly Shanghai recently. Not until I clean up the operations here good and proper which may be as long as 3 to 5 years as I am building it from the ground up. Eh... August we go see play lah! AMPANG YONG TAU FOO IS FOUND IN AMPANG, MALAYSIA UNDERSTAND!!! FA: Welcome to the blog! And yes, thank you for the little info update, Captain Obvious. As the name suggests, the cuisine hailed from Ampang but I was refering to the Ampangians (Ampangese? Ampangeans? Ampangs? Ampangish? AmPengYew?) who slaved away in the kitchen starting from the wee hours of the morning just to make our palettes tingle and our tummy happy.